Are you considering a kitchen remodeling project? Typically, a kitchen remodel is the most expensive home improvement project — so it’s normal to worry about making costly mistakes. And you might even think twice about taking the time to research and plan such a large project. You can go it alone, spending your weekends visiting showrooms and scouring the Internet for kitchen remodel ideas & design plans. You can spend a little more money upfront to enlist the help of a full-service design firm who will see your project through from start to finish. #1 – What do I really need in my kitchen? Start by evaluating your current kitchen and how it works for everyone who uses it. Don’t jump right to the fun stuff — such as picking cabinets or granite — that comes later! What do I like and dislike about my kitchen? How often do I cook? How many people cook in here at once? What features do I want to add to this room? How often do I entertain and for how many people? Does anyone in this house have special needs? Am I planning to sell this house soon? #2 – Do I need to get a building permit? Kitchen remodeling is a major undertaking, and the cost of a building permit is usually a very small part of the total budget. The building code that a permit is based on focuses on serious issues — such as fire safety and structural integrity. In most areas, a building permit is required before you begin any major remodeling project. Don’t take a chance… get a permit! #3 – How long will it take to remodel my kitchen? The construction phase of a kitchen remodel usually runs 4 to 12 weeks. A lot depends on how well you’ve planned ahead of time. For example, if you have all of the materials for your kitchen renovation at the job site before a contractor begins the work, then your kitchen can be completed more quickly. That kind of coordination requires a deep level of planning though. A kitchen remodeling master list (such as the furnishings and fixtures commonly used in a remodel) can include over 200 items. Your project won’t require all 200, but checking each one ahead of time will help to avoid surprises that could blow your budget — and timeline — later. #4 – Is it possible to design an upscale kitchen without spending a fortune? The trick is using a professional kitchen design firm that caters to a wide range of clientele. By starting upscale, your choices are limitless. Then, after seeing all of the options that are available to you, you can easily pare things down to meet your budget. So, don’t be scared away by a showroom full of exquisite dream kitchens. That’s exactly the kind of place you want to visit! Even the best showrooms have a few displays that look far more expensive than they really are. Knowledgeable designers can turn expensive tastes into your dream kitchen and save you money with a variety of less expensive, high-quality options. Here are 6 questions you should ask your kitchen designer. #5 – Could I get more space in my kitchen without adding on? There are 4 ways to get more space in your kitchen without adding onto your house. Boost the storage space in your current kitchen layout. Create a more efficient layout within your current kitchen. Take space from an adjacent room to make your kitchen bigger. 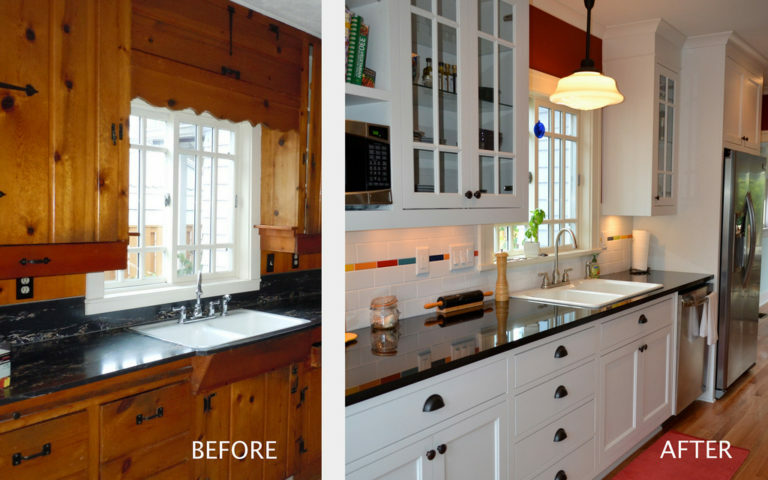 Flip your kitchen to a larger room in your house. All 4 are successful strategies, depending on your current kitchen workspace and layout. Ask a designer to show you a few different options for your kitchen project. There are lots of ways to design a kitchen. The best way to begin the process of remodeling your kitchen is to gather details on a variety of design styles and layouts that inspire you to create an elegant, functional, and efficient space.